Hi folks, Doc here. Through the years, most manufacturers have included one or two small battery powered lamps - similar in size and wattage to flashlight bulbs - in at least some of the sets in their product lines. However, these lamps were limited in power and adaptability (not to mention color!). Today, however, we have a wide variety of options and technologies to choose from when lighting our models. In this tutorial, I'll discuss my favorite lighting method: LEDs. Lighting will add more realism and action to your favorite models or displays, which is just what I wanted to do when I designed my Rocket Jets Amusement Park Ride model for the 2001 A.C.G.H.S. Convention. I wanted to incorporate a large number of lights of various colors and intensities into all parts of the model. Unfortunately, for some of the intended locations I couldn't connect the lights to a remote power source, since these location were on a moving (rotating) platform. A.C. Gilbert actually addressed this very issue when he created the Erector lighting kit; it included fiberboard insulators and a rotating commutator to pass current from a stationary part of a model (where the power source was located) to a moving part of that model. Although it works, it is an awkward solution and is limited in its adaptability. Specifically, I wanted to use lights inside the rocket jets which were suspended from the model's rotating top assembly. While the rocket jets themselves were large enough to conceal a regular dry-cell battery, I didn't want to add that additional weight. Further, I wanted to use different types of lights in each jet: a small, bright red light in the nose and a large, diffuse red light in the tail to give the appearance of an exhaust flame. The answer was to use Light Emitting Diodes (LEDs). They are small, lightweight, and are available in a wide range on colors, styles, and brightness. In addition, they can be powered by small, lightweight "coin cell" batteries, which allows them to be used in almost any location. LEDs are different from ordinary light bulbs because they do not have a filament to break or burn out. They generate very little heat, and are ideal for putting lights into battery-operated equipment like telephones, toys, and portable computers. While LEDs are not the solution to every lighting application, they were the perfect answer for my design needs. 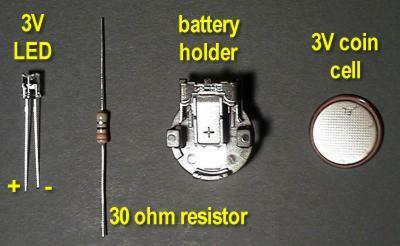 The image below shows the basic components of a generic, single-LED circuit. In this example, the LED is a bright, "wide-angle" red LED. The coin cell can be of virtually any size and type, as long as the voltage is matched to the LED. The resistor is required: while there are a few types of LEDs that can function without them, most LEDs need an appropriately-sized resistor in the circuit to prevent them from burning up. The diagram at right illustrates a basic LED circuit. NOTE: LEDs are polarized, i.e., current must pass through them in the correct direction. If current direction is reversed, the LED will not light. LEDs typically have one leg longer than the other, and in most cases, the longer leg is the anode (+). Resistors, on the other hand, are NOT polarized: they can be wired into a circuit in either direction, and in any location, so long as they are in series with the LED (see diagram). The voltage and current of the LED being used dictate the resistance required for any given circuit. Usually, both pieces of information are printed on the package the LED comes in. However, for most general purpose LED applications, the information in the table below will help you determine the resistance you will need, given only the LED's voltage. NOTE: You may not find resistors which match the values listed in the table. In that case, just get the closest thing you can find (and, larger is better than smaller). For example, I chose 3-volt LEDs for use in my rocket jets; according to the table, these LEDs require 30 ohm resistors. However, the closest I could find were 33 ohms, so these are what I used. They worked perfectly. The image below shows one of the circuit boards I made for each rocket jet. For weight and ease of use considerations, I used ¼"foam core art board and cut it to fit snugly inside the body of a jet (a T boiler). The pointed front end fits into the jet's "nose cone" (a plastic U boiler top), while the narrow back end fits inside the jet's "exhaust tube" (a W boiler stack). 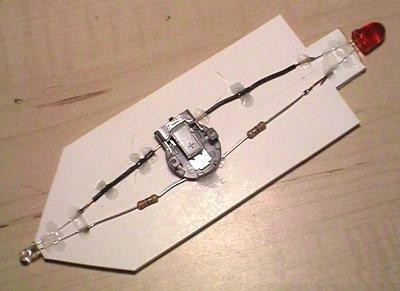 The LEDs and their corresponding resistors were soldered together, then soldered to a coin cell battery holder, using single strand copper wire where necessary to extend the circuit to fit on the board properly (select a wire gauge approxiamtely the same diameter as the resistor and LED "legs"). The final step was to hot-glue the completed circuit to the circuit board. A note on soldering: for those of you who are not electronics hobbyists or professionals, the process is fairly simple, but do be sure to use the correct tools and materials. When I was growing up, my Dad, a big tool guy and amateur craftsman, always had a soldering kit in the workshop. It contained a soldering "gun", a large and imposing tool looking like something out of Flash Gordon (or Star Wars, for that matter). It had a pistol grip and a large, heavy wedge-shaped metal tip. The coil of solder in the kit was about half again the diameter of the lead from a #2 wooden pencil. Many of you will remember such a device, and many of you may actually own one. In any case, do NOT attempt to do delicate electronic work with either the gun or the solder. Instead, visit your local home center or electronics store and buy a soldering "wand" with interchangeable tips and thin, fine-grade solder that is designed for specifically for electronics and other fine soldering work. Such kits are not expensive, and are a must for projects such as this. So, I used these incredibly light weight circuit boards in my rocket jets to give them that added dimension, but I also used LEDs on the non-moving part of the model. I put yellow LEDs in the rocket insignia on the front of the ride "tower" and I used blinking red LEDs on the sign over the entrance to the ride (see the Rocket Jets Ride pictorial in the Model Gallery or the Rocket Jets Building guide on the Tips & Tricks page). I could have powered these LEDs with coin cells as well, but because I didn't have the restrictions of motion to deal with, I decided to use a low voltage power adapter (transformer) to power them instead. I hid wires on the back side of supporting girders and other parts, then brought them together beneath the model's base and connected them to the adapter, which operates on house current. Saves a few bucks on batteries, and the adapter can be used to power other thing as well, including battery powered motors, etc. Finally, don't rule out another cheap and easy source of illumination for your rides and displays: strings of mini-lights. For many applications, these are a good choice. If you want to use a large number of lights of one color, and you have room to hide the wires, you can't beat them. I designed a large backdrop for the Rocket Jets model which featured an Erector Amusement Park scene. I wanted to add lights to the scene in dozens of locations, basically lighting all of the rides and attractions pictured in the scene like a real amusement park or carnival. I used a string of white mini-lights, pushed them through strategically located holes from the rear of the backdrop, then secured each light (again from the rear) with a dab of hot glue. The final result is very effective, and mini-lights could be used on a model just as effectively.